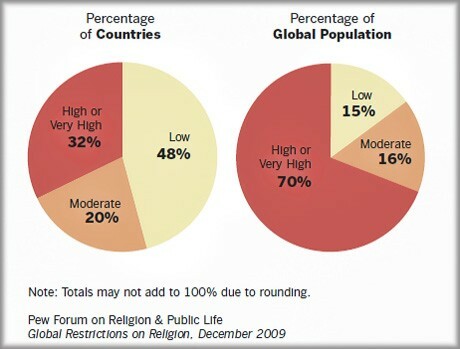 Pew Forum on Religion & Public Life report found that a minority of countries have high restrictions on religion, but these countries contain most of the world’s population. 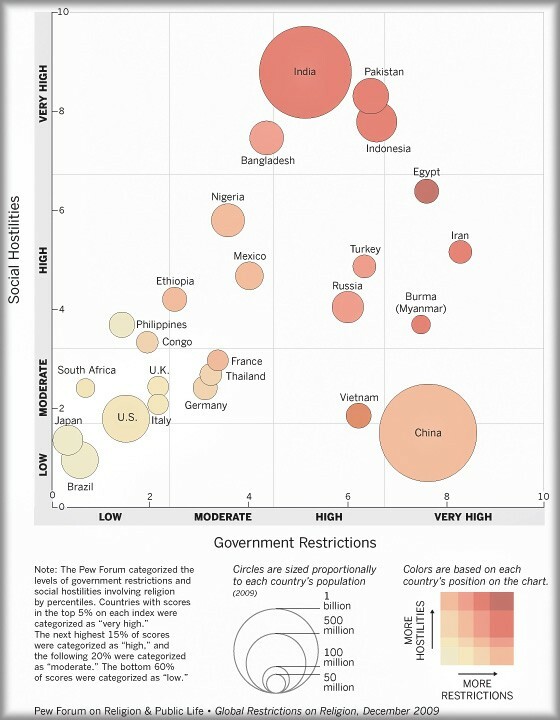 Of the world’s 25 most populous countries, Iran, Egypt, Indonesia, Pakistan and India have the most restrictions, while Brazil, Japan, the United States, Italy, South Africa and Britain have some of the lowest levels. 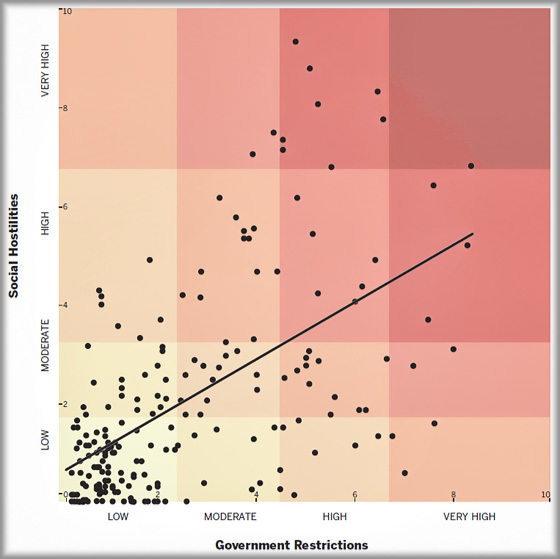 The report found that the percentage of the world’s countries with high or very high government restrictions is at about 20 percent, which amounts to 57 percent of the world’s population. These countries include Saudi Arabia, Iran and former communist countries, such as Russia, Belarus and Bulgaria, where state atheism has been replaced by favored religions that are accorded special protections or privileges. 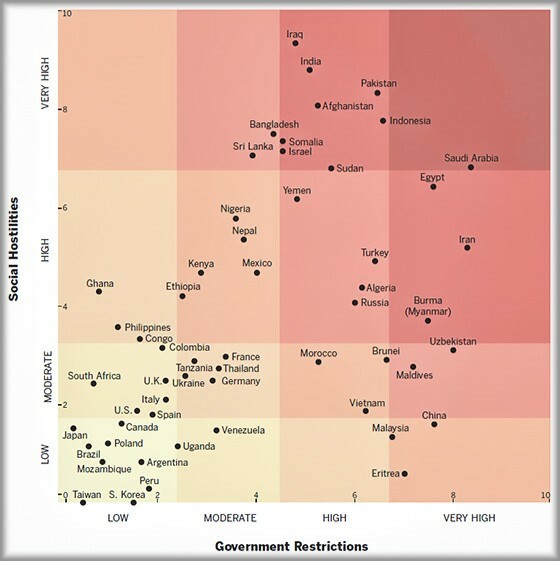 Among the world’s 25 most populous countries, Iran, Egypt, Indonesia, Pakistan and India stand out as having the most restrictions when both measures are taken into account, while Brazil, Japan, the United States, Italy, South Africa and the United Kingdom have the least. 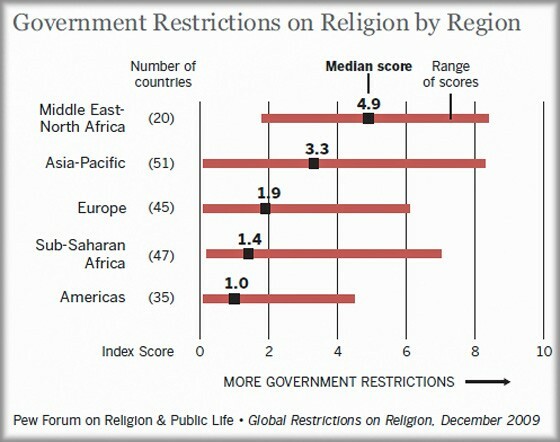 The Government Restrictions Index is based on 20 questions used by the Pew Forum to assess whether governments – including at the local or provincial level – restrict religious practices or beliefs. A- Does any level of government ask religious groups to register for any reason, including to be eligible for benefits such as tax exemption? B- Does any level of government formally ban any religious groups? C- Is religious education required in public schools? 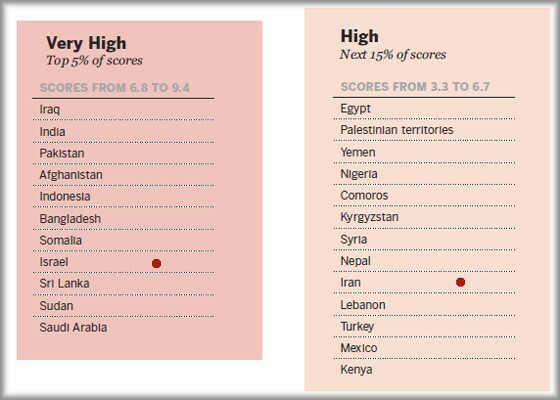 On average, restrictions are highest in the Middle East-North Africa, where the median score for the 20 countries (4.9) is considerably higher than for the 35 countries in the Americas (1.0), the region with the lowest median score. Restrictions on religion can result not only from the actions of governments but also from acts of violence and intimidation by private individuals, organizations or social groups. 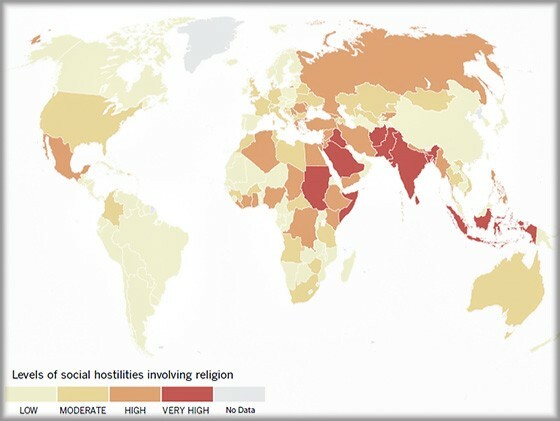 The Social Hostilities Index is based on 13 questions used by the Pew Forum to gauge hostilities both between and within religious groups, including mob or sectarian violence, crimes motivated by religious bias, physical conflict over conversions, harassment over attire for religious reasons, and other religion-related intimidation and violence, including terrorism and war. At the top of the social hostilities index were Iraq, India, Pakistan, Afghanistan, Indonesia, Bangladesh, Somalia, Israel, Sri Lanka, Sudan and Saudi Arabia. 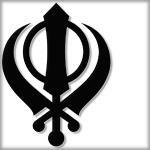 A- Did violence result from tensions between religious groups? B- Were there acts of sectarian or communal violence between religious groups? C- Were there incidents of hostility over conversions from one religion to another? Israel stands out on the list of countries with high scores on the social hostilities index as most of the other countries are either failed states, highly authoritarian or have recently undergone civil wars. Israel’s score is driven up by security policies that sometimes have the effect of limiting access to religious sites, and by its preferential treatment of Orthodox Jews. The government recognizes only Orthodox Jewish religious authorities in some personal status matters (such as marriage) concerning Jews and devotes the bulk of state funds provided for religion to Orthodox Jews, even though they make up only a small portion of all Jews in Israel. 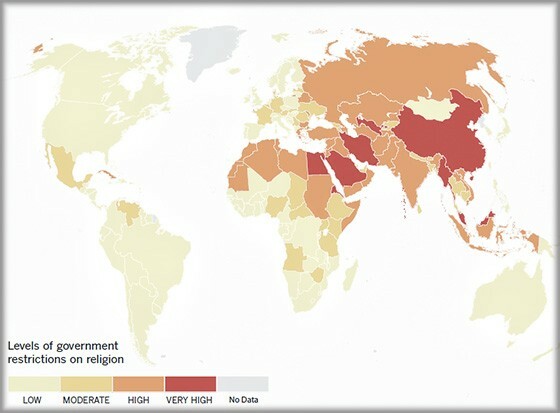 The Pew Forum identified 16 widely available, frequently cited sources of information on government restrictions and social hostilities involving religion around the world. These sources, which are listed below, include reports from U.S. government agencies, several independent, nongovernmental organizations and a variety of European and United Nations bodies. Although most of these organizations are based in Western countries, many of them depend on local staff to collect information across the globe. As previously noted, the Pew Forum did not use the commentaries, opinions or normative judgments of the sources; the sources were combed only for factual information on specific policies and actions.